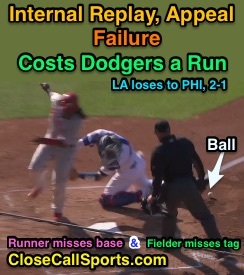 Philadelphia spoiled Clayton Kershaw's DL return, defeating Los Angeles 2-1 as the Dodgers failed to appeal that Maikel Franco missed home plate, an internal instant replay error that cost LA a run and, possibly, the game. Whether John Pratt, LA's video coordinator, Bench Coach Bob Geren, Manager Dave Roberts, or even catcher Yasmani Grandal failed to launch the appeal effort, the home team lost by just one run, signaling that in the expanded replay era, a failure to challenge can cost a team a win. Dodgers staff failed to appeal Franco's touch. The Play: With two out and two on (R1, R2) in the top of the 2nd inning, Phillies batter Jorge Alfaro hit a 1-1 curveball from Dodgers pitcher Kershaw to center fielder Bellinger, who threw to catcher Grandal as Phillies baserunner R2 Franco attempted to score. Replays indicate that although Grandal did tag Franco, he had dropped the ball well in advance of making contact, while Franco himself failed to touch home plate. The Call: After surveying the situation, HP Umpire Will Little employed a "safe" mechanic. Although the Dodgers had the opportunity—and even effected a mound visit—with Aaron Nola set to bat, Los Angeles neglected to appeal Franco's failure to touch home plate before Kershaw threw his first pitch to Nola, thus cementing Franco's baserunning as legal and officially giving Philadelphia the first run of the ballgame. The Rule: Official Baseball Rule 5.06(b)(1) describes the simple objective of a runner: "In advancing, a runner shall touch first, second, third and home base in order." OBR 5.09(c)(2) and 5.09(c)(4) govern the relevant appeal and state, "Any runner shall be called out, on appeal, when—(2) With the ball in play, while advancing or returning to a base, he fails to touch each base in order before he, or a missed base, is tagged..(4) He fails to touch home base and makes no attempt to return to that base, and home base is tagged." Lest one thinks that Grandal simply stepping on home plate while holding the ball constitutes a valid appeal, the rulebook is very clear: it's not (Rule 5.09(c)(4) comment is as follows). An appeal should be clearly intended as an appeal, either by a verbal request by the player or an act that unmistakably indicates an appeal to the umpire. A player, inadvertently stepping on the base with a ball in his hand, would not constitute an appeal. Mechanical Analysis: The MiLB Umpire Development (PBUC) Umpire Manual expressly covers the case of a runner who misses home plate, while the MLB Umpire Manual merely suggests a course of action. For illustration, the PBUC literature states, in part, "On a play at the plate, should the runner miss home plate and the fielder miss the tag on the runner, the umpire shall make no signal on the play. As outlined in the previous paragraph, the runner must then be tagged if he attempts to return to the plate; if he continues on his way to the bench, the defense may make an appeal." 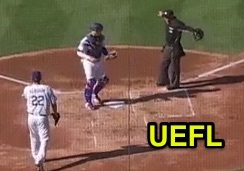 Little signals "safe" as Grandal steps on home. The MLB Umpire Manual is very similar to PBUC, with one glaring difference (highlighted in blue): "...should the runner miss home plate and the fielder miss the tag on the runner, it is preferable that the umpire make no signal on the play." 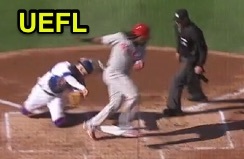 In other words, this is a mandatory mechanic at lower levels ("shall") , but not at the Major League level ("preferable"): Little's mechanics, thus, are not inherently correct nor incorrect, since MLBUM suggests, but does not require, the demonstration of no signal on this play. To illustrate further, only a mechanic of "out" here without a tag and without a proper appeal would be conclusively and strictly incorrect. After all, the runner is technically not out until and unless a proper appeal is executed. Play Analysis: Mechanics aside, the rules and manuals place the onus on recognizing that a runner has missed home plate on the defense ("The defense is required to recognize that the plate has been missed"). Though more astute teams and players may understand that no mechanic from the plate umpire generally signifies a missed base and missed tag, those with an even greater understanding of the rules realize that the option to appeal is never nullified by an umpire's real-time call (especially in the expanded replay era). The defense always retains the opportunity to timely and properly appeal prior to an ensuing play (pitch) or attempted play—an umpire's "safe" mechanic doesn't change nor prevent that. And regardless of what Little's mechanic was or wasn't, the Dodgers had ample time to review the play and opt to file an appeal...yet the home team failed to do both. Franco runs through and past home plate. Accordingly, we have no way of knowing for certain (as it should be) whether Little would have ruled Franco out on appeal for missing home plate or if this would have resulted in a Manager's Challenge, meaning that Replay Review Regulation V.F.3. had no chance of coming into play ("The Replay Official shall rule the runner "safe" at home plate unless the defensive Manager appeals the failure of the runner to touch home plate prior to the Crew Chief making contact with the Replay Official"). Conclusion: Just as Replay HQ missed a call earlier this week, Los Angeles' internal replay staff missed a call here. The only difference is that in failing to appeal Franco's non-touch, Los Angeles conceded an undeserved run to Philadelphia, eventually losing the game by just one. Mechanically speaking, while it is preferable to make no signal, MLB allows its umpires the opportunity to declare the runner safe, be it "safe—no tag" or, simply, "safe" on its own. In the minors, however, unless the "safe" ruling is on potential obstruction/interference or a swipe tag away from the base (or, naturally, that the runner has touched home plate before being tagged), the umpire "shall make no signal on the play." No, there was no interference nor obstruction on this play.